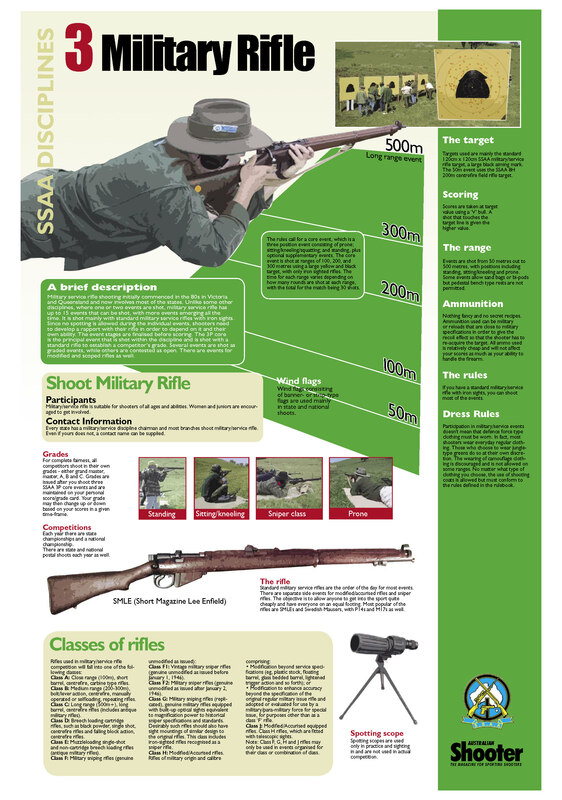 The SSAA Victorian MRC runs monthly competitions for standard and modified military rifles over ranges out to 500 metres, as well as regular commemorative shoots to recognise D Day, Long Tan, and Victory in the Pacific. The core event is a three position competition shot at 100m, 200m, and 300m. The club also shoots a number of other specialty shoot competitions which are included in the national Combined Services Discipline rule book. These include snap and rapid fire events, as well as deliberate long range precision events. Regular shoots are held at two separate venues: SSAA Eagle Park Range and SSAA Springvale Range. The Eagle Park Range is on Gifkins Road , Little River and hosts the monthly MRC competitions for both pistol and rifle (up to 500m). Competition shoots are on the first and second Sunday of each month (except January). The club also shoots at the SSAA Springvale Range (handguns – centrefire or rimfire) every Monday night from 5pm. In addition to regular monthly club competitions, the MRC holds a number of special events throughout the year where it competes against other clubs and associations. Check the Club Rifle Calendar for dates.